Note: The whiteAnt is being discontinued in January 2016 to make room for our newer 3D printer, the blackAnt. The whiteAnt page will remain here as a resource for those who own it and we will still provide support for it. Here is your chance to build a machine that can form 3D plastic models that builds objects up to 160mm x 190mm x 125mm, literally from the bottom-up. Traditionally called an FDM machine (Fused Deposition Modeling), the whiteAnt will create 3D models by "depositing" extruded plastic from a nozzle, "fusing" the plastic, layer-by-layer, starting from the bottom of the model to the top. 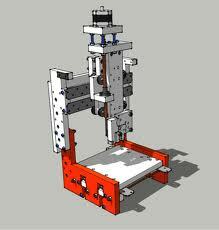 Change the form factor of the machine, by lowering the frame, inserting a Dremel, and you have a mini-CNC milling machine. The easiest way to get started is to buy the book!! For those that did purchase the book, the plans are here. The book guides you through the entire process of building this machine from scratch. Moreover, and the most exciting part of this book, is that it will help you master the electronics wiring (Gen 4) and software setup (ReplicatorG) for all of these types of machines (including the makerbot). You will dog-ear the heck out of this book! The current kit provides hardware, structural components, motors, and mechanical components. The travel for each axis is: X-160mm, Y-190mm and Z-125mm. Below are the electronics that can be purchased separately. The video is a demo of the machine working. The machine is creating a model of Thom York that can be found on Thingyverse.com (Ting number 1218). The following videos are provided as the guides to assemble the whiteAnt 3D Printer. The book can be used as an alternative to these videos for the purposes to assemble the kit; however, these videos pertain only to the kit and not to a scratch built machine. The book is the only guide to scratch build this machine.